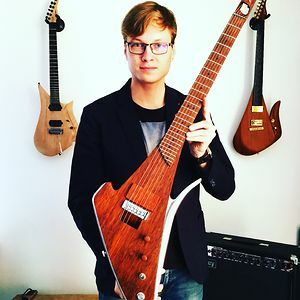 I am Rapolas Grazys industrial designer and musician from Lithuania. My main profession is product design and i am focusing on an interdisciplinary approach to sound and design. After creating high-end audio designs, worldwide conceptual and interactive art installations, futuristic technology concepts i have started to specialize in one of a kind product creation – boutique section. I have created LAVA trademark on the principle of cross pollination between the fields of acoustics and modern instruments design concepts crafted using very authentic materials. 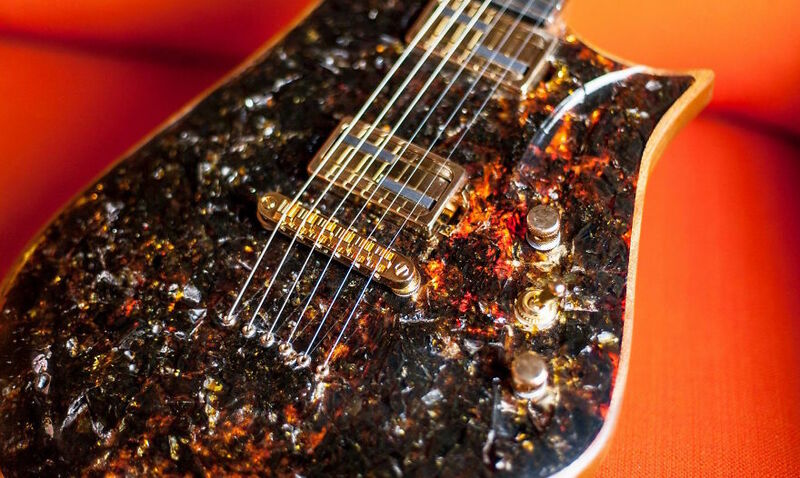 The main idea of Lava Drops is to create and build playable art musical instruments from very rare and exclusive/organic materials, which give a unique sound and visual to each instrument. Modern instruments that influence others to create. I am creating from rare materials like: black amber, aircraft aluminum, bell brass, wood that is used for building ships, exotic and rare wood, stiffened volcanic lava mass, gold, silver, titanium etc. After creating the ergonomic six-string fretless Lava Drop electric guitar which was the first guitar from the Lava Drops line i have expanded the line with very light, versatile, comfortable Lava Drop (+) model and the innovative Lava Drop (X) which is the first laser controlled guitar in the world with separate laser MIDI controller, aircraft aluminum contour and stiffened volcanic lava inlays. At 2016 i have started the Platinum, collectors line of Lava Drops. 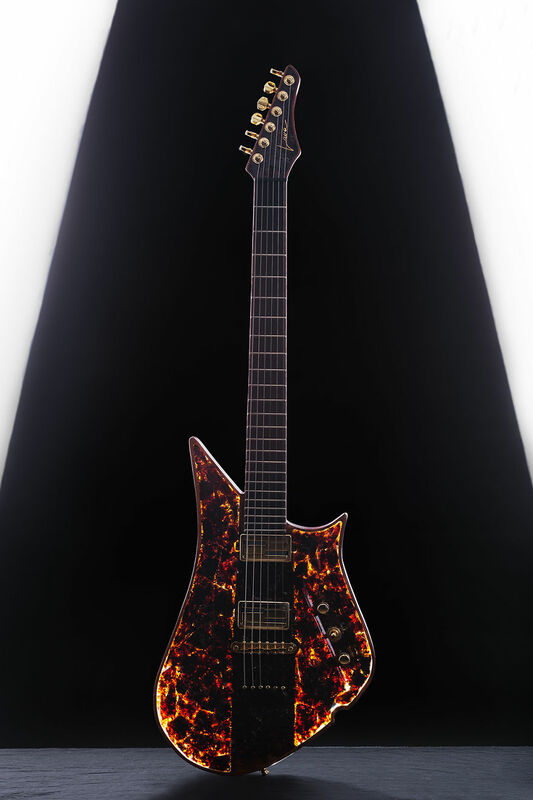 The first instrument from the Platinum line is “the Black Amber Drop #1”. 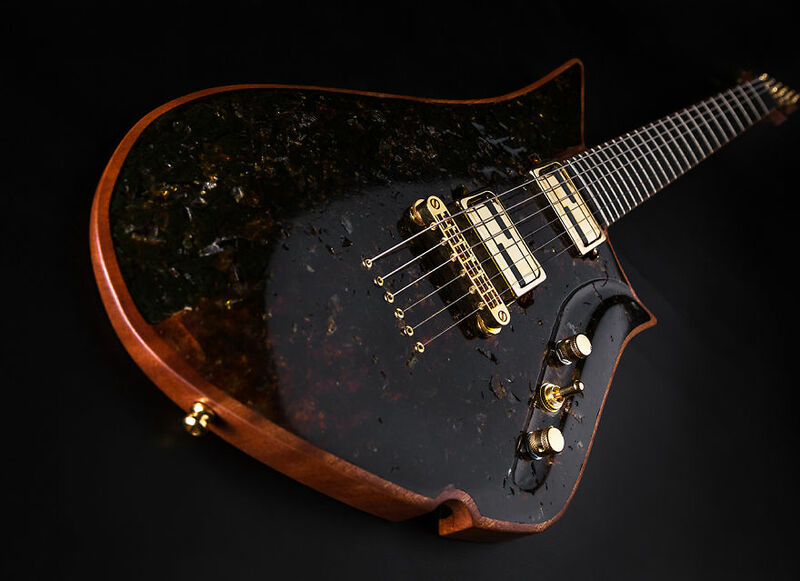 I wanted to build a guitar that connects the past and the future while also giving a nod to my home – Lithuania, where black amber from the Baltic sea is harvested. The construction of the guitar is a single seamless piece of sapele for the body and neck with an ebony fretboard and 24-3/4” scale length. The neck has a truss rod that is reinforced by two rods of carbon fiber. The sapele has been routed out in the body to house the 4.4 pounds of Baltic black amber, with a 5mm rim around the inlaid amber rocks. Baltic amber is over 50 million years old, produced by the Pine trees which grew in Northern Europe and around the Baltic Sea. It is also considered by many to have therapeutic properties due to its high level of succinic acid, a compound said to have analgesic and anti-inflammatory properties. The fact that the Baltic amber is millions of years old is humbling to say the least when you pick this instrument up to play. The guitar as an instrument is a joy to play, with a very fast and striking response to notes and chords, likely from the rigidity of the amber. The neck has a rounded neck profile, with large frets that give way to fast riffing. The pickups are Lace Alumitone humbuckers, and rounding out the looks of this one of a kind guitar are gold hardware, and a 24 karat gold Lava Guitars headstock logo. 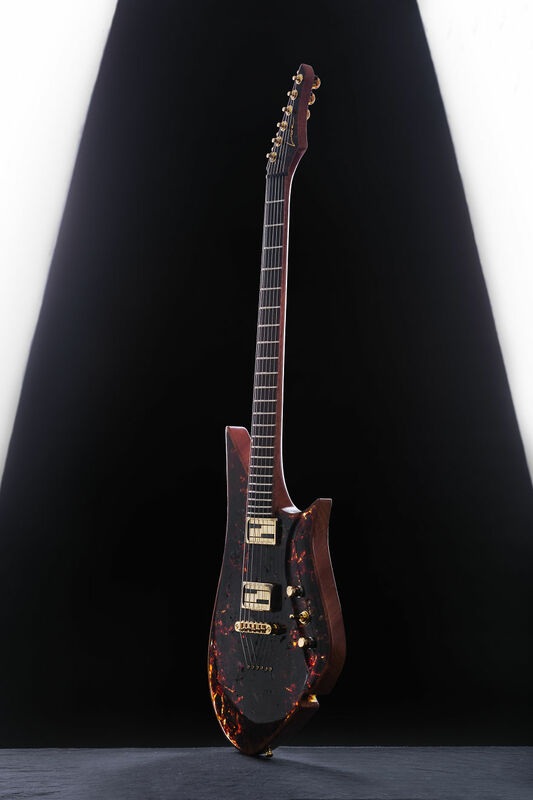 Innovative Lava Drop X – laser controlled guitar with integrated Laser MIDI controller. 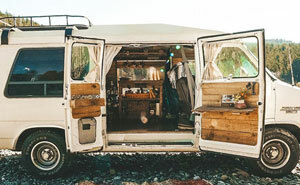 Crafted from wood that is used for building ships, aircraft aluminum, volcanic lava inlays, bell brass details. 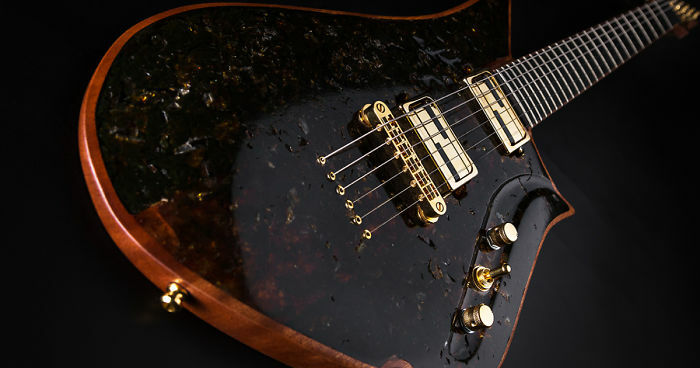 Lava Drop X – electric guitar crafted combining different types of exotic and rare wood together with aircraft aluminum and volcanic lava rock details. Lava Drop plus – very light guitar crafted from one piece of European Maple wood.